UMBC students and faculty members hold themselves to the highest standards of academic excellence and research rigor, but at the same time foster an environment of support and camaraderie. This culture has made it fun to pursue my research interests and extracurricular passions, and it’s certainly prepared me for my future career. Cheli Arussy came to UMBC with an interest in medicine following a year volunteering at the Pediatric Dialysis Center at Shaare Tzedek Medical Center in Jerusalem. After hours of hard work in UMBC faculty labs, that spark grew into a clear career plan to become a medical researcher and professor. Once on campus, Arussy jumped right in, pursuing her degree in chemical engineering while doing research in the lab of Mark Marten, chemical and biochemical engineering. She quickly became a leader in the lab, training nearly 20 new lab members. Arussy then went on to work on prostate cancer research with Chuck Bieberich, biology, and spent two summers as a student researcher at MIT. Arussy is a member of Tau Beta Pi, the honors engineering society, and a recipient of the national Tau Beta Pi scholarship and the Carmi Award at UMBC. She is a Meyerhoff Scholars Program affiliate, member of the Honors College, and has presented at six research fora. She has also earned notable recognition for her research, including UMBC’s Undergraduate Research Assistantship Support Award and Undergraduate Research Award, and became a member of Sigma Xi, the national honor society for scientific research. This fall Arussy will pursue her Ph.D. at Stanford University, where she hopes to create electronic, wearable materials to help patients restore their sense of touch. 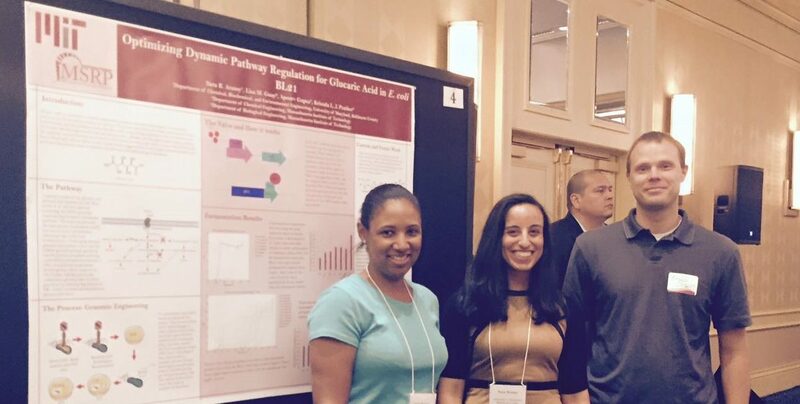 Image: Cheli Arussy, center, pictured with her faculty mentors from the MIT summer research program, which she participated in twice; photo courtesy of Cheli Arussy. Portrait by Marlayna Demond ‘11 for UMBC.